"Undoubtedly, for the peace process, this is an important test," said Patricia Munoz, a political science professor at the Pontifical Xavierian University. BOGOTA, Colombia — A leftist former guerrilla faced a young conservative lawmaker Sunday in a presidential election to decide who will lead Colombia as it implements a still-fragile peace accord. One-time militant and former Bogota mayor Gustavo Petro and frontrunner Ivan Duque harbor contrasting views on the historic accord ending Latin America's longest-running conflict and could significantly shape how Colombia proceeds with putting key aspects of it into motion. Petro is vowing to uphold the 310-page accord while Duque wants to make changes like requiring ex-combatants to serve time before entering politics if they are guilty of crimes against humanity. Under the final agreement, rebels who fully confess and offer reparations to victims are unlikely to be sent behind bars. The first presidential vote since the signing of the 2016 accord has polarized voters, pitting even close family members against one another. Duque won a first-round vote held in June, topping Petro by 14 percentage points but falling short of the majority needed to avoid a runoff. Recent polls indicate Duque still holds a decisive advantage but suggest the distance between the candidates is narrowing. 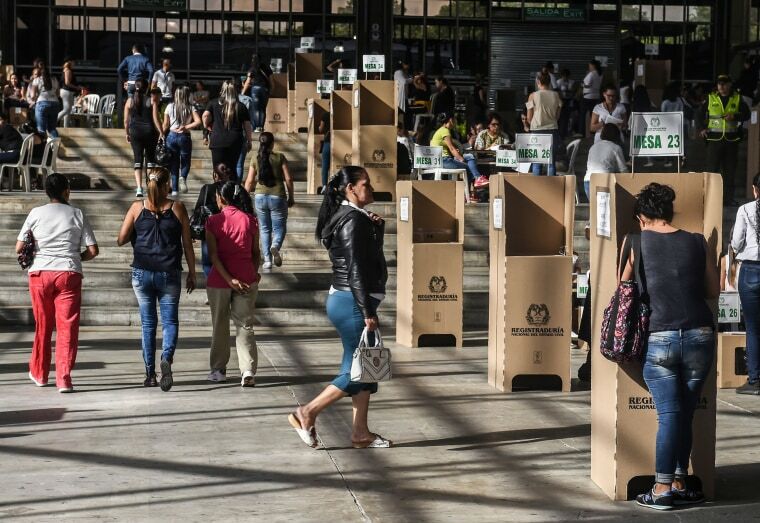 Colombians began forming lines outside voting centers Sunday morning as polls were opened. Officials said 53,000 police officers would be stationed at voting sites throughout the nation to ensure a safe election. During decades of conflict, voting centers often were targeted by leftist rebels who considered the political system a sham. Defense Minister Luis Carlos Villegas said this year's local and national elections have been "the safest in the last two generations." Duque is the protege of powerful former President Alvaro Uribe, one of the most admired and abhorred leaders in Colombia's recent history. On the cusp of turning 42, Duque would become the youngest president in Colombia in more than a century. Critics are wary that the father-of-three's limited experience in politics could leave him dependent on Uribe, who is the leader of his party's bloc in the Senate. Though millions of Colombians praise Uribe, some giving him an even cult-like status, others contend his advances as president came at the price of grave human rights abuses. While he succeeded in boosting Colombia's economy and weakening illegal armed groups, he presided over the government at a time when military officers killed thousands of civilians who were then dressed up as rebels to inflate body counts in exchange for vacations and bonus pay. In a sign of how tense relations between both camps of voters remain, even acts of nature have turned into fodder for political jousting. A week before the vote, a swarm of killer bees attacked supporters who showed up to see Uribe speak at a Duque rally in a small town in northern Colombia. Supporters of Duque accused Petro backers of launching the bees in an act of "biological terrorism." "Now African bees as Petristas," Petro groaned later on Twitter, using the play on his last name used to describe his supporters. "Is it because they are worker bees?" Officials later said Uribe's helicopter had likely stirred the bees into a frenzy. Petro, a former member of the M-19 guerrilla group that signed a peace accord with the government in 1990, is promising to overhaul Colombia's economic model. He wants to free Colombia from dependency on fossil fuel exports and raise agricultural production by increasing taxes on unused lands and giving them to poor farmers if the owners sell them to the state. His early fondness for the late Venezuelan socialist leader Hugo Chavez and a now-ditched campaign pledge to create a constitutional assembly have sparked fears among some that he'll make Colombia "another Venezuela." Analysts say Petro's candidacy is an important development in a country where more than five decades of conflict against rebels created a stigma around any candidate who appeared to sympathize with leftist causes. If he were to win, he'd likely face an uphill battle in implementing any of his campaign proposals. His allies represent a minority in congress and would struggle to pass any laws. Duque's own proposed changes to the peace accord may also encounter considerable resistance. Though he could implement reforms by decree, he would more likely choose to go through congress. Even though his allies represent a majority, some could push back against any changes that would put the accord on shaky ground. Observers suspect Duque himself might modify his positions if elected. In the final weeks before the vote Duque has repeatedly said that he does not want to "shred the accord to pieces" and has tweaked several of his positions. "The entire panorama today indicates the peace process is not reversible," Munoz said. "We have a society that does not want the FARC to return to armed conflict."